Discussion in 'Dovetail Live Article Discussion' started by TrainSim-Steve, Sep 27, 2018. As has been popular with our previous Studio Updates, I managed to get another opportunity to sit down with Matt today to find out more about what's happening in the Studio. Awesome! We finally get nice, thorough details on the editor! That's very exciting, I can't wait to start using it! Small question, though- if the HST and Class 66 are done, shouldn't there be an update coming for GWE? This is excellent news. I am looking forward to having a go with the route and scenario editor! Finally we have a timeline for the tools open beta! I've got plenty of UE4 assets ready for the sim, so I'm looking forward to being able to get them in game and to see how the sim handles pipes/connectors and brake rigging etc. Really happy with that article being about the Editor Tools. I think this is just what we needed to hear. Will console players be able to access the third party content created on PC? I shure hope you will have better dependency system than with TS20XX.. Its near impossible to find out if a Workshop activity will work on with my Collection of DLC. Mostly it simply ends with a cryptic message while loading it, which gives me no clue on what is missing. Great for PC players, but not for console players. Don't forget, a whole lot of your players are on console. Console players, including me, won't be happy. I also saw something about the HST being completed, I thought it was done already? So will I finally be able to add new paint jobs to existing stock instead of completely overwriting the original paint? I figure this could be done by making an entirely new locomotive or train car, but it would be a bit nicer if there was support for repaints specifically. It's nice to see we are closer to the release of the editor in beta testing, then hopefully its actually release next year after tweaking is done to make it right. Well, this year brings a lot of good news from DTG, first of all the x64 version of much loved RailWorks and then Editors for Train Sim World. Great to finally see some visible evidence of the Editor Tools at long last. Interesting to see "Tools" as opposed to "Tool" used. Presumably one very simplified tool will be for scenarios and one or more for routes, locos etc? I wonder if editing existing and creating additional services will be allowed by the "Tools"? From the article it's not clear that general availability of the tools will necessarily be this year. Whilst not one who has any intention or ability to create new content other than scenarios my first impression on seeing figure 1 is to wonder if all the complexity represented by the lines is really needed in the finished game. I can understand that they may be required within individual components but is there not a way in which some of them could be precompiled, or whatever the word is, for use in the released game? I realise that for modding purposes individual components will be required in an "uncompiled" state but that's just a storage issue for those wanting to create or mod content. Those just running TSW or creating scenarios don't require that level of detail IMHO. Out of interest I wonder what that structure is on the platform? Does it denote the limits within which characters boarding/exiting trains are spawned/exist? You have basically just described what UE4 calls 'cooking.' Whenever you package a project for public use, all the files in the project are cooked to remove all the extra parameters which, as you said, aren't needed beyond editing the component itself. The real question is how the editor will interact with all that, but yeah, ideally scenario creating won't need all that extra info. Great news! Can't wait to build scenarios for the steam workshop in TSW! Looking forward to what other content creators, as well as myself, come up with for TSW, post release. That is, once it's got some time out, in the community's hands, of course. Outstanding news, DTG! Can't wait! I'm hoping this will, at some point, set the stage for a wider range of workshop support, other than just scenarios and routes. On one hand, the editor will be a great opportunity to finally be getting some 3rd party content for TSW. On the other hand, it's a huge disappointment for console players to not be getting the same 3rd party content as PC players will be doing. I do hope that there is a plan going on for the console version, in the near future, so that the PS/Xbox players will have the same experience as the PC players. This news for sure makes up for the delay and it’s been a while since we got really heavy good news regarding TSW as a core game, I can’t wait to see what the future holds for us! Great question. Hopefully, they'll allow for some cloning of current routes, in the case that they don't allow for extensions to the actual base DLC. That way, people don't have to completely start from scratch on already existing route DLCs. Fantastic news. Well done. Will we be able to create our own services timetables too? that good news about editor. suggestion what about option to make content via editor on pc then load it on usb stick or wifi and transfer it to xbox one tsw account. They are talking about the new physics. I wasn't asking for the editor to be on consoles, I was asking for the created routes to be available on console. In short, you'll never get access to the same amount content as PC users, and even DTG can't tell you any more than that at this point in time. Currently developers are waiting for details of the Xbox Community Content service. Until it's known exactly what that service will look like and when it'll be implemented, DTG won't be developing their own mod distribution architecture like Bethesda have for Fallout and Skyrim. Bespoke distribution architecture is a lot of effort to develop and implement, and it could be replaced a couple months from now by Xbox Community Content. Sony are currently very restrictive on the types of files you can distribute, so this really limits the mods, even Bethesda with their own mod distribution architecture have issues, and many Fallout mods that are on the Xbox One are not permitted on PS4. Things are not looking very bright for mods on the PS4 at the moment, so if you're going to choose a console for TSW going forward, the Xbox One is the better bet. It's also worth noting that even if/when mod support becomes available on consoles, Microsoft and Sony will police copyright/trademarks, and mods with TOC and railroad logos may well be taken down. These processes are usually automated, so even if a TOC/railroad are not bothered about a freeware reskinner, the automated system may well take action regardless. That is up to Microsoft and Sony, and looking at what current games have mods on PC and what games have mods on console (Skyrim and fallout 4), Both of those companies are very very closed to the idea of user created mods without an ESRB or PEGI rating. So that means it will be up to dovetail to check every single fan created asset, route and session for restricted content, submit those findings to a ratings board, and then submit that to Microsoft or Sony. The only other option would be a system of trusted developers releasing paid expansion packs to cover the cost of certification, but the second you throw money in the mix, us users start getting quite high expectations. I was not expecting an announcement regarding the editor let alone screen shots.. This is great news! Having access to the tools will greatly change the game and hopefully encourage more people to start playing it. I am quite excited to see what our wonderful community will be able to create. Unfortunately, I think this is out of DoveTail's hands, unless Epic, the owners of Unreal Engine release a console version of Unreal Editor, there's nothing they can do . User created content could be OK, if Sony and Microsoft allow mods like they do with Fallout. But, Intellectual Property could also cause a problem. For example, if I re-skined the HST in Virgin livery, and distributed it free of charge via Dropbox, PC users could download and use it. That, would seem to be OK. However, if that livery is distributed via the walled gardens that Sony and Microsoft employ, there could be problems. As a console player I would be more than happy if we just got access to new scenarios created by the community as the five or six that come packaged with a route don't last very long. I understand the issues with copyright etc but some sort of distribution of community content for consoles, even if it is a 'lite' version, of the PC would be much appreciated. Positive: DTG honestly calls the editor beta- stadium. You should do that with your whole TSW...beta or crowdfunding or early access for the full price. Negative: then definitely no updates will come anymore, the customer can repair the errors himself now...or not. Too bad. Not a dime and not a minute of lifetime for DTG / RSC / Kuju products or whatever you call yourself tomorrow. Hi, it wasn't the editor I was wanting, it was community created content that I want. All console players just want the same as PC players. The thing with consoles is that it is relatively uncommon to be able to install mods and other things the same way as you can on PC. This applies for any game, from GTA to TSW. Yes, there may be some games which allow *some* sort of modifications but it’ll never be to the extent of PC. That’s the way it has been and will continue to be due to the limitations of consoles and it’s software and operating system. Though I am not saying it isn’t possible to export and extract PC mods to console for TSW. We will just have to wait and see. There will definitely be more updates! How do think people get community created content, it comes from having a editor to create such content. What he meant was wanting the community created content not only on PC but ported over to consoles as well. Most console players will not care for the editor tools to be on consoles anyways. Unless if the game has a built-in builder mode of some sort, which TSW does not have. You didn't quite read my message properly there, what I said was that I'd like community created stuff (created on PC) to also be on consoles. Well, you are on consoles. Mods getting on consoles is quite unlikely. There are exceptions, but the overwhelming rule is that you go to PC if you want mods. Even assuming there was support for community made mods, there are lots of issues to consider. All the mods are made on PC, so what if someone makes something that could run on PC, but can't be handled by a console? How do you handle cases of mod A requiring mod B, but then mod B isn't on consoles while mod A is? Which system do you even use to handle the mods? There aren't really any built-in systems to the consoles, and DTG would probably be left making something from scratch. Would they have the time for that? There will no doubt be trains made that simply have too much going on for a controller-what happens if someone put one of those on consoles? The solution to a lot of that is just super heavy involvement with DTG's QA to make sure things work, and block off the things that don't work. And that would be third parties making paid content. The best bet for anyone else getting stuff on consoles is for it to be published by DTG. That moderation and QA doesn't come cheap either, so its unlikely free mods would be able to take that route. So...only count on all first party DTG things getting on consoles, as well as some official DTG approved third party content, but I imagine not all of the third party stuff. But that raises an interesting question: will someone working as a DTG partner need to release their stuff on PC and console to be a partner? Might sound a bit harsh, but I hope not. While I get that DTG wants everything on both platforms, that's not true of everyone. (Eg: Someone working on their own probably won't have the time to make the console related tweaks-which would put small groups of people at a disadvantage.) It would be a bit unfair to have someone make something like Sand Patch, then be told DTG won't sell it on Steam because it won't work on consoles. That would be a bad business choice too. It would definitely be a good recommendation, but certainly should not be a requirement. What version of UE4 should we use to be compatible with the editors? 4.16 is the version of TSW. What's this Article 13 that you mention? Is it some copyright thing? 4.16 is the current version of TSW but the initial version of TSW was an earlier version (4.14?). I'm sure TSW will be upgraded to a later version at some point as we've been on 4.16 for quite a while whilst the (recently released) latest UE4 version is 4.20 IIRC. I loved getting some information about the developer tools - I'm especially interested in the scenario builder. Article 13 is a new copyright law in the European Union. It's been just over 2 months since this article was released but still no sign of the Open Beta or live streams mentioned showing the tools. I downloaded the UE4 Editor a while ago and have followed several online tutorials on how to use it. Are we still expecting to see something this year (considering there's only 4 weeks left of it) as I for one am raring to go? 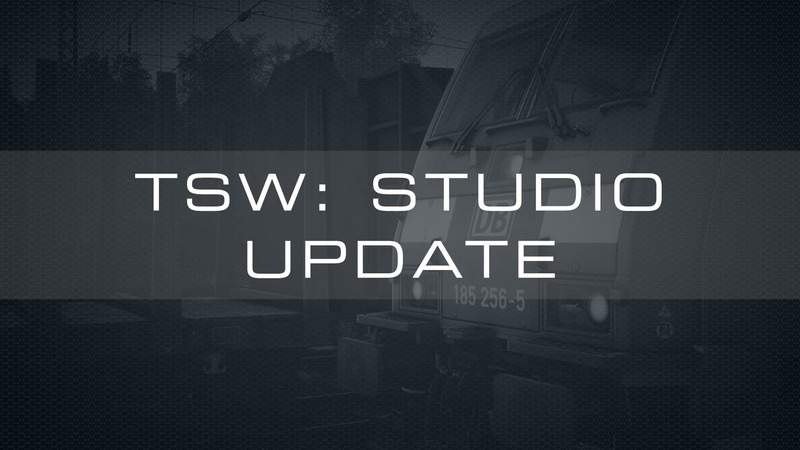 The last TSW Studio Update was on 25th October. There is another article in progress as I write this and will be ready soon.